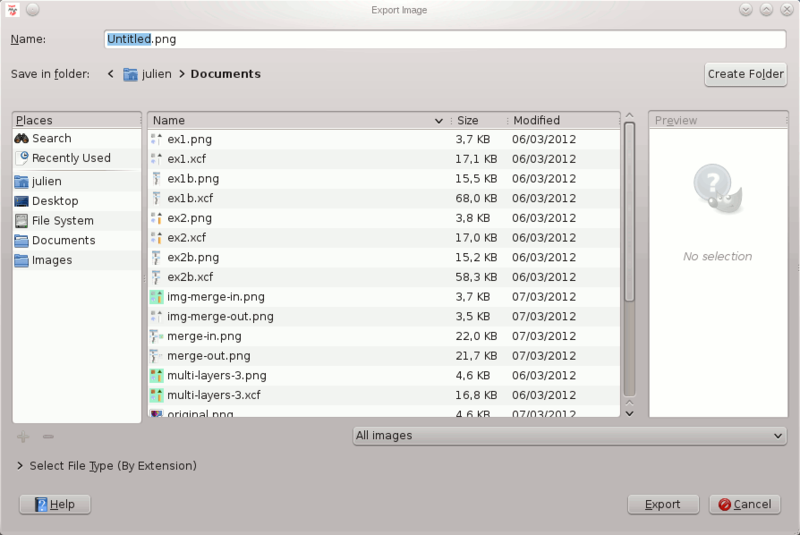 With GIMP-2.8, the Save command saves images in XCF format only. The Export command is now used to store images to various file formats. With this file browser, you can edit filename and extension directly in name box (default is “Untitled.png”) or by selecting a file in name list. You must also fix the image destination in Save in Folder. You can create a new folder if necessary. File formats dialogs are described in Section 1, “Files”. When file name and destination are set, click on Export. This opens the export dialog for the specified file format. If you have loaded a non-XCF file, a new item appears in File menu, allowing you to to export file in the same format, overwriting the original file. If you modify an image that you already have exported, the Export command in File menu is changed, allowing you to export file again in the same format.